Amelia Island off the Northeast Coast of Florida is one of the most pristine places I have ever visited. Tucked between the mighty Atlantic Ocean to the East, the ICW (Intercostal Waterway aka Amelia River) to the West, Georgia’s Cumberland Island National Seashore to the North, and Jacksonville’s Big Talbot Island State Park to the South, Amelia Island is a historic gem probably more well known for it’s fancy resorts like the Ritz Carlton & Plantation than for being the home of a booming running community. Chris Twiggs, a eight time Hardrock 100 Finisher who grew up on Amelia Island and is now the National Program Director for Jeff Galloway, help resurrect the Amelia Island Runners. His professional guidance to relative new comer to the race directing world, Caleb Wilson of Llama Running, along with support from Mike Melton‘s Race Management & FUR (Florida Ultra Runners) have turned the young Fort Clinch 100 into a true destination paradise for ultra marathoners looking for a challenge. Nothing Great is Easy! So True! 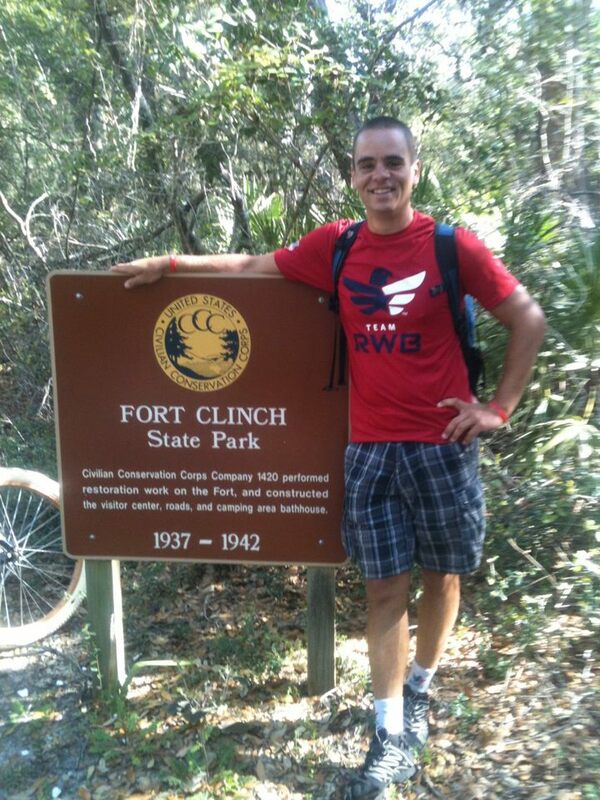 Caleb worked tirelessly for months to secure sponsorship and permits for his race which is held on the North End of the island entirely within one of Florida’s most popular state parks, Fort Clinch. As Race Director Caleb was inspired by Micah True, better known to most as Caballo Blanco from Christopher McDougall’s bestselling book Born to Run. Caleb ran his first 50 mile race in the Copper Canyon of Mexico in 2010 and was the first runner to complete the distance in Vibram Five Fingers after Barefoot Ted McDonald, founder of Luna Sandals. He returned in 2012 shortly before Micah’s passing. 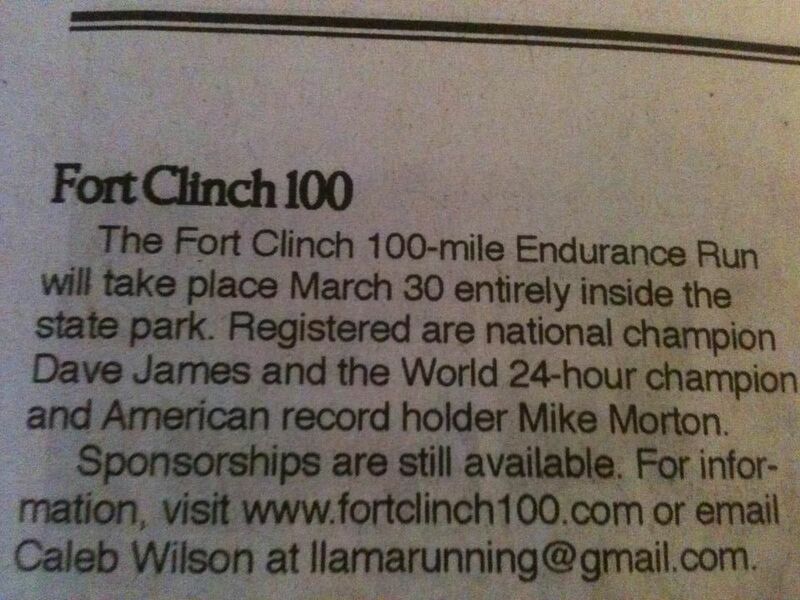 For the 2013 edition of the Fort Clinch 100 Caleb had secured commitments from both myself and 24 Hour World Champion and Floridian Mike Morton. Unfortunately as our training was beginning for the “Showdown Around The Fort” Mike was injured. 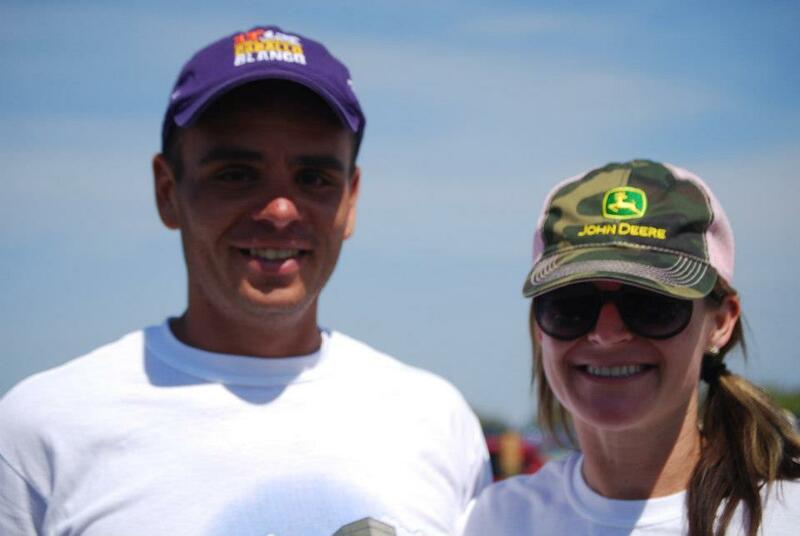 Mike had hoped to be able to still race, but the Wednesday before the race he had to pull out but sent his support to Caleb and checked in after the race too. For me this came as bittersweet news. Mike is a true running legend whose win at Western States before Scott Jureck‘s streak of seven in a row predates my knowledge of what a marathon, let alone ultra, even was. I wanted to race Mike in his home state since we talked about a possible match up at the site of my first 100 mile win Ancient Oaks in Florida. With my medical school schedule and Mike’s amazingly busy 2012 we could not make AO100 2012 work. When Caleb contacted me about racing Mike I was immediately interested! Having not been back to the Sunshine State, except for a connecting flight, since 2009 when I ran my course record on the AO100 course, I was excited to cross the Georgia-Florida boarder the Monday before the race with Caleb. After checking into the host hotel, Amelia Hotel at the Beach I headed to the beach to run barefoot on the soft sand that I had been separated from for nearly four years. I turned around at the pier inside Fort Clinch State Park knowing I would have ten chances to experience the changing tides from the structure on Saturday. After an amazing relaxing run back to the hotel I caught a much needed nap and woke up for another run with Caleb. I had spent the previous week fighting off a cold in the frigid early spring temperatures in Connecticut visiting my family, friends, and the United States Military Academy in West Point, New York. 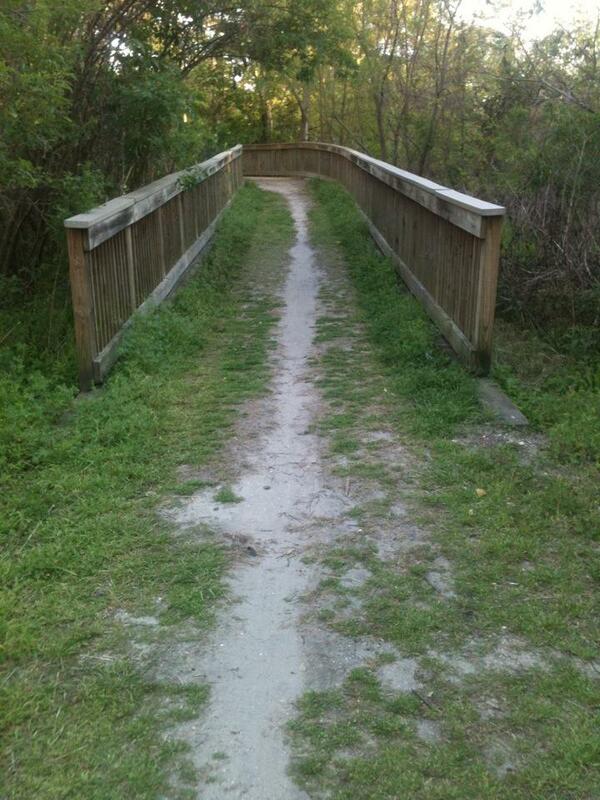 I was exhausted when I awoke from my siesta but wanted to explore some new “Florida” trails! That Monday evening Caleb and I ran on Egans’ Creek Greenway to chirping birds and a setting sun among salt marshes. It was incredibly peaceful and healing after a busy start to 2013 to get a true Spring Break. After an incredible sunset I tucked into bed early trying to rid my body of the infection. Tuesday morning I awoke early in the dark to get a feel for the timing of dawn and sunrise since Saturday’s race was set to start at six in the morning. I was shocked that the sun did not rise until almost 7 am and worried at how cold it was. Later that morning I got an easy couple hours in on the green way trails & beachfront neighborhoods before lunch with Caleb at the Historic Crab Trap Restaurant Caleb assured me the weather would warm for the weekend. I was getting excited! Wednesday morning brought record lows to Florida’s First Coast with near freezing temperatures. My beach jog required a hat, gloves, a jacket & tights! I thought I had just left New England. After checking out of the host hotel so I could camp under the stars and full moon, Caleb and I ran the race courses’ trail & beach sections. Seven to eight miles of the course were surprisingly not flat or fast. I was even more bummed that Mike Morton had given Caleb the final word that he was a “no go” now that I had seen the course’s twists and turns. After a late lunch I explored the old Victorian style downtown. 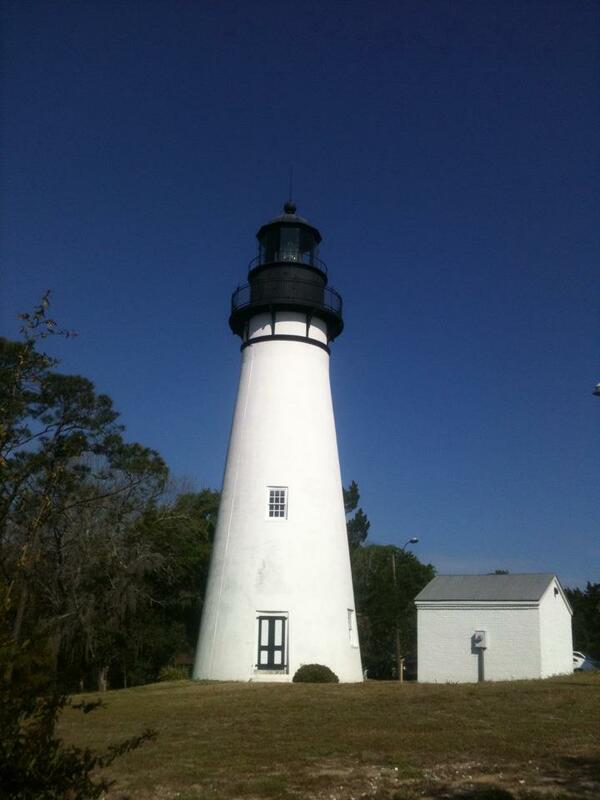 Some of Amelia Island’s buildings date back to the 1800s. 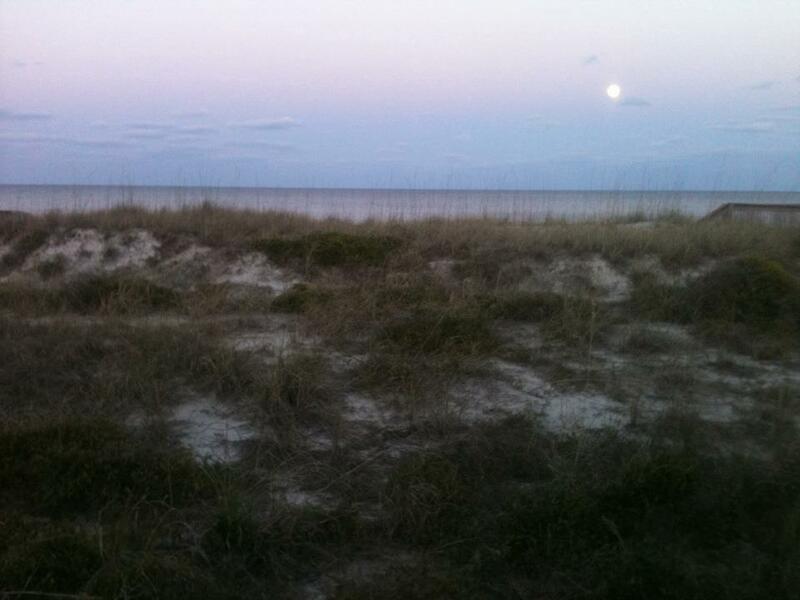 I saw deer frolicking around the coastal dunes as I hiked up the beach to my camp site after an amazing sunset. 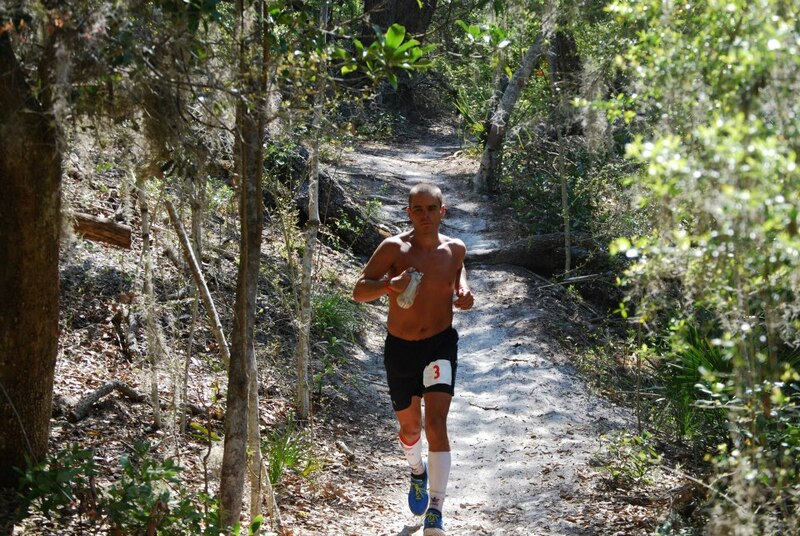 Florida is special to me for more than it being the site of my first hundred miler in 2008 at Stu’s AO100. In 2004 my fiancée Jen & I took our last trip here before her cancer returned to take her to heaven. It was January 2004 & after a successful chemotherapy / mastectomy treatment in the fall of 2003 her doctors were excited that she would beat the odds. The doctors gave us the blessing to take a week in Florida where we had both vacationed together before. On the Gulf that January Jen was happy and became comfortable being in public on the beach without her wig with her hair starting to grow back. Before the chemo Jen had the most amazing long blond hair and it was hard for her to come to grips with the side effects of her treatment that included her hair falling out. 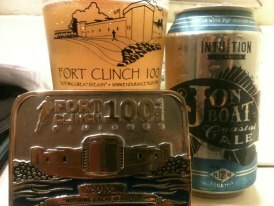 The weekend of The Fort Clinch 100 was scheduled on the tenth year anniversary of the last trip Jen & I ever took anywhere besides hospitals. She loved the beach so in late March 2004 just weeks after doctors had informed us that her cancer had not only returned but metastasized to her lungs, spine, and brain we decided that we would visit the Shore one final time. 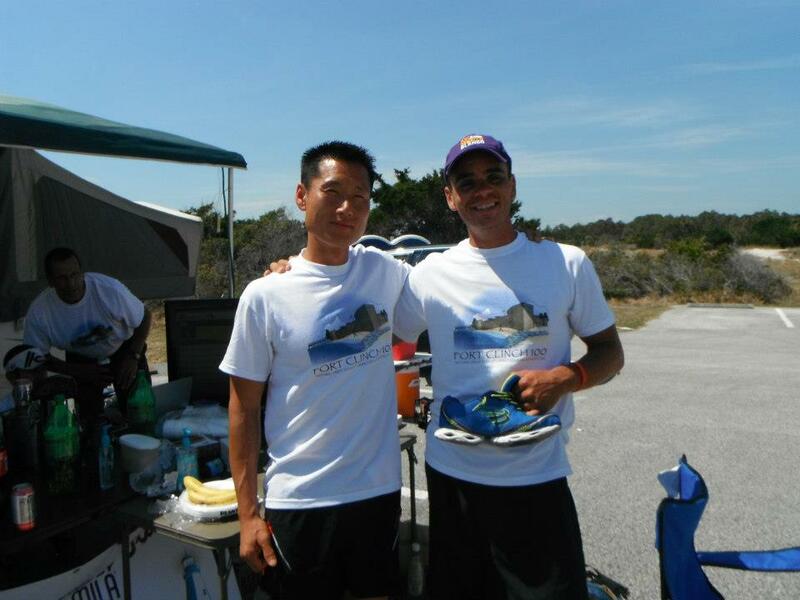 I ran the Ocean Drive Marathon in Cape May, NJ the morning after we had our last meal in a restaurant together and made love for the last time. 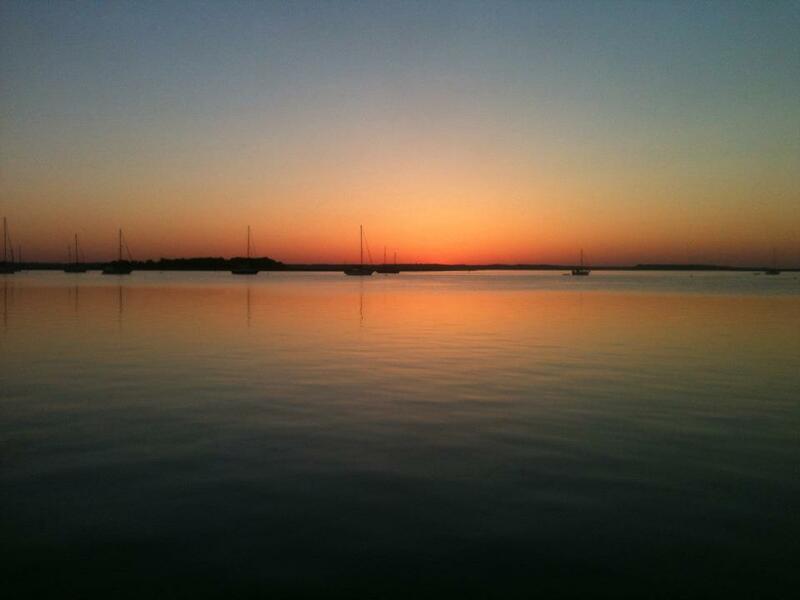 After Jen passed away I returned to Florida often to mourn, remember her, and run. In 2005, 2006, 2007, & 2008 I returned to the Space Coast, Gulf Coast, and Disney to race and heal my soul. It was in Florida in the spring of 2008 I began to feel I was ready to move on with my life athletically and academically. Thursday morning I awoke to the bright Florida sunshine & sounds of seagulls between crashing waves. Hoping that NyQuill had done the trick I brewed up some fresh coffee to walk the beach and pier mentally trying to prepare myself for the hundred miles that lie ahead on Saturday. After a good tempo run on the beach and trails in reverse of the race direction Caleb and I headed out for a late breakfast. I spent another afternoon hanging around the historic downtown Fernandina Beach. 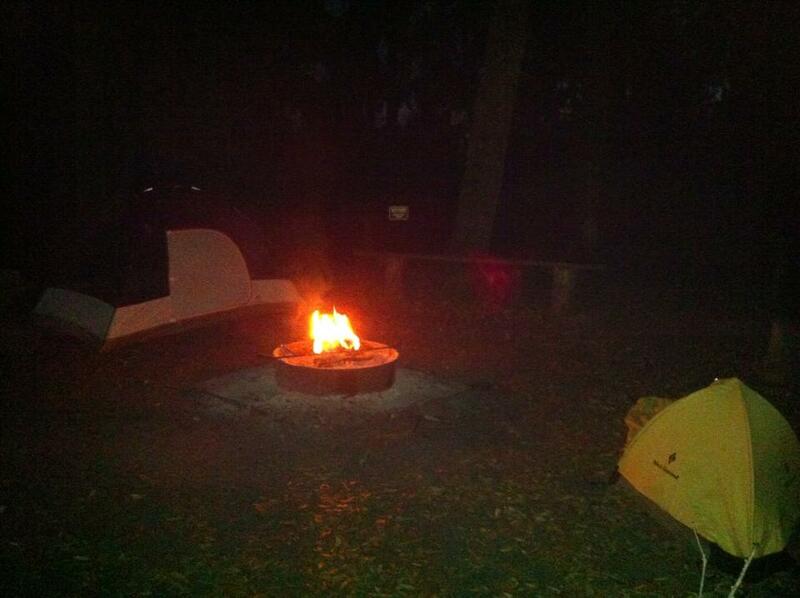 After a burger and beers with volunteer extraordinaire Gene Meade it was time for a night’s rest under the stars. Gene would almost single handily run both remote aid stations Saturday and refill my Ultimate Direction handheld bottles multiple times for me. He was an incredible help to Caleb and everyone! 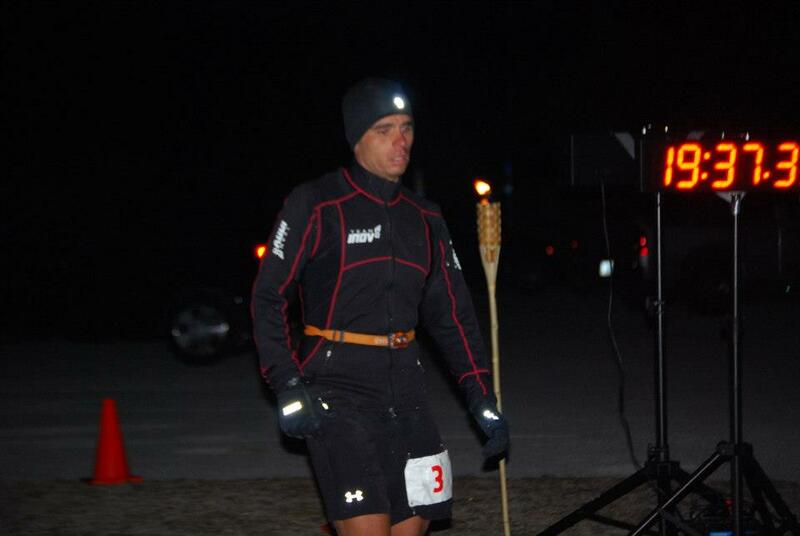 We all wish him well Saturday at the Umstead 100, my first buckle race. 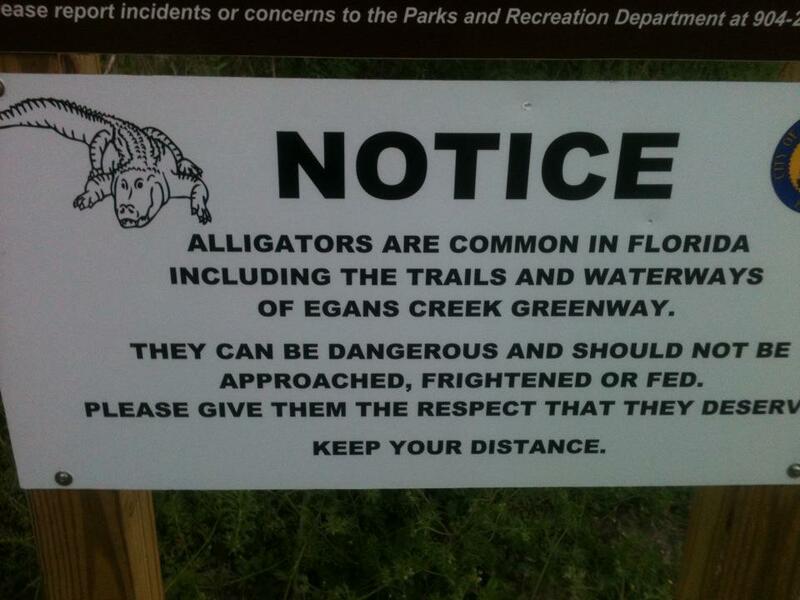 When Caleb and I were pre-running the course we saw three alligators in a pond. Minuets later with my adrenaline pumping I heard a noise in the bushes. I jumped thinking I was about to be gator bait. Alas, it was a squirrel, but not just any small squirrel! A huge monster of a squirrel that could take down a gator and bull shark simultaneously! Luckily the killer squirrel would not attack while we camped out, but we did hear him take out a raccoon as we dozed off. Friday morning came quickly and we slept in as the cold front was still lingering. After a morning of coffee, blue corn grits, and fresh fruit we packed up camp and started to set up the start / finish area. I sent my clothes ahead to packet pickup and got one final beach run to work out the nerves. Moon River Pizza served incredible pizza at Red Otter Outfitters as runners nervously gathered to pick up their numbers and swag which included a FC100 logoed Pint Glass from Intuition Ale Works, a custom logo comfortable T-shirt, and Endurance Trust water bottles, and Fitful jackets. Aid Station Captain Susan Anger, Dr. Claire & I ducked out to watch the sunset over the ICW as the last runners checked in. As I crawled in my Black Diamond bivy after a shower and dusk walk on the beach Caleb went out to mark the course under a full moon. Game time! Saturday morning came early. It was cold and I was in a cold sweat, shivering with a sore throat when my 5:30am alarm went off. At 5:55am as I was lacing up my new Spira Blue Stinger 2’s that had just arrived the night before, Caleb informed us the race start would be pushed back to 6:30am. I was thankful that I would get to enjoy another cup of coffee. I fueled up with some GENr8 Vitargo and tucked back into my sleeping back. I sat shivering as I ate a banana and some cold leftover Moon River Pizza. As Caleb announced a minute to the start I crawled out of my sleeping bag, took off my Spira tights, and INOV8 Louis Garneau sweatshirt and toed the line determined to win but not ready to race. A hundred miles is a long way and anything can and does happen out there. As we started on the mile asphalt section I began to pull away even at my slow hundred jog pace. When we hit the osculating, sandy, single-track it was still dark. I had to adjust my eyes and slow my pace. Most everyone had a headlight but I choose to forego mine. I knew dawn would soon arrive. I left my Ultimate Direction bottles at the first two aid stations with only a sip from each used. It was still chilly and I started with my Gore-Tex gloves, Mountain Hardware ski hat, arm sleeves, and even my Team Red, White, and Blue T-Shirt. I was wearing the RWB Eagle proudly on my Dry Max socks and Compression calf sleeve too! I could only find one calf sleeve in the morning as my bivy was a mess of clothes. I hoped the white medical grade compression circa University of Bridgeport 2009 on the other calf would do the trick too. It did! 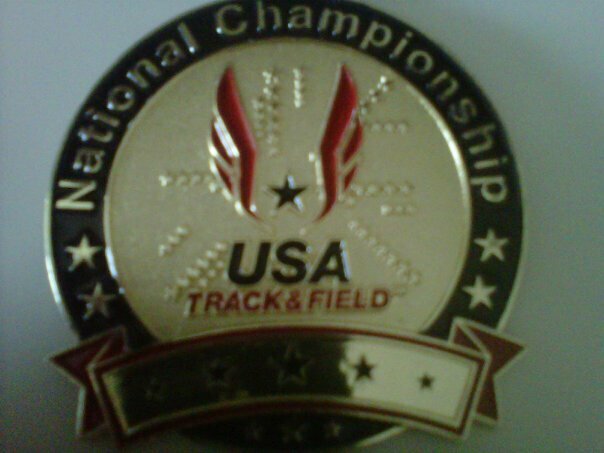 Last summer during the Olympics my three nieces and I would sprint barefoot around their back yard as I would hand out my USATF Championship medals to the Gold, Silver, and Bronze Medal winners; Emma Jennifer (my goddaughter the oldest and perennial Gold Medalist), Kate, and Sara. I knew I would have to dig deep mentally to win Saturday running at maybe 70 percent and being sick, but the balance of the fun times ahead with my family and the great memories from the past would get me through the rough patches that would dominate the day. March 30th race day is also a very special day as it is my gorgeous twin nieces’ birthday! Sara Marissa and Kate Sophia were born in 2010 when I was in my first semester of medical school on a break from racing. I can still remember that day they were born when I put down my histology text to hold them for the first time. I had spoken to my sister Christina the day before the race and she asked me to win it for them. I complied. 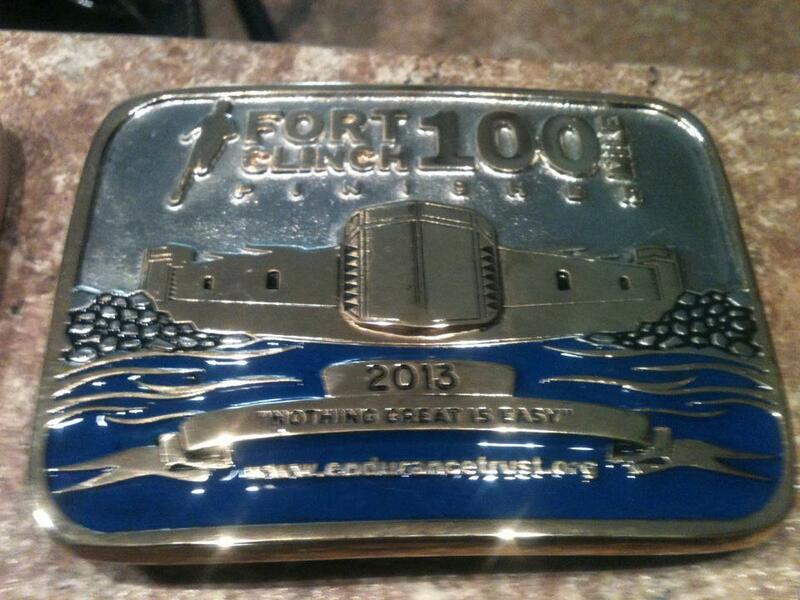 Knowing that I was to get to see them again after the race I was excited to get to present them with the gorgeous aqua blue Fort Clinch 100 buckle. After the first loop I chuckled as there was a runner barely a few minutes off my tail. I thought I should pretend he was Mike Morton, but that mental game didn’t work well. After twenty miles the runner was still close. After thirty he was still not that far off. The guy had balls and I respected that. I did not want him to blow his race so I warned Caleb to give him a head’s up. I later found out he was a retired Army veteran named George Barthelmes from Florida running his first hundred. I knew come fifty miles he would be reduced to a walk going at the pace he was on the slippery sandy terrain or end up as one of the best hundred mile runners of all time. Sure enough, as I came in at mile forty or fifty I found out my lead that was minuets was now nearly two hours. Loops four and five ere beautiful and uneventful as I began to easily lap other runners. Our exchanges were pleasant and the running was becoming easier as I slowly backed off to an easier pace in the heat of the mid day sun. Temperatures rose above eighty with some significant humidity. In a preventative measure I asked for some ginger ale to settle my stomach. Caleb didn’t have any, but much to my surprise only five miles later at the amazing alligator loop aid station the FURbies offered me some! After sixty miles I made a conscious decision to shut it down physically. I was going to finish, win, and set a new course record regardless of what effort I continued to put forth. The race had been decided. I have run enough of these fast hundreds to know that with the effort to sustain that pace comes pain and discomfort that I didn’t want to risk knowing my body was already fighting off the infection I had. I knew there was no way I would lose save a shark or killer squirrel attack. Maybe medical school has made me soft or smart? I replaced the Blue Spira Stinger 2’s for an old beat up pair of Black INOV8 230s that were falling apart. My feet felt fine I just wanted a change of “tires.”. I took some pizza and mixed in the “Galloway” ultra method of walk breaks. I timed my running to be limited to the trails, which I was enjoying more anyway, so that I could be back for my 8th loop before dark to get my Petzl headlamp. I had caught a chill on the concrete pier right before mile 80 and my left Trapezius, Llevator Scapulae, and Rhomboids tightened up so I had to wear the lamp around my waist which worked well cutting down on the shadows from the roots. Dr. Claire paced me from mile 80 to 90 providing me with laughter, the best medicine! 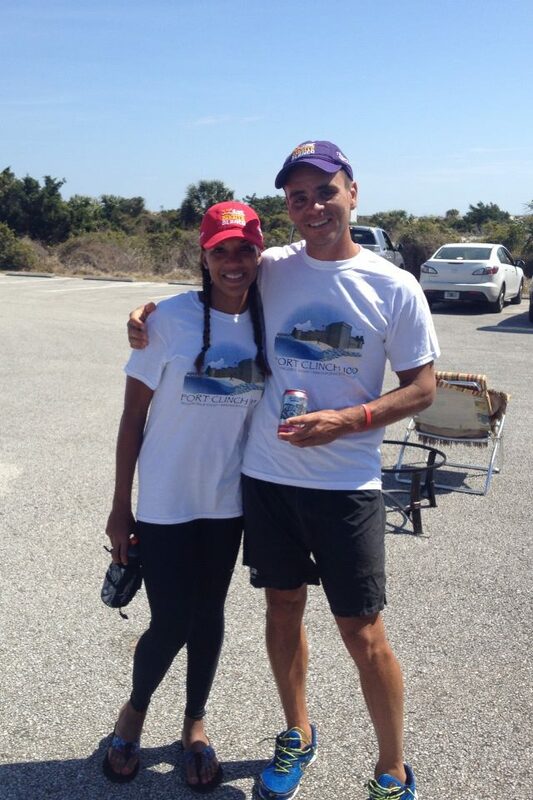 I bumped into Dr. Claire Denise Johnson around mile 78 and asked if she would be willing to do a loop with me. She agreed and met me at the start / finish. I took an old INOV8 LG jacket, and some more pizza and we headed out. We walked two miles joking and catching up since we had met in Mexico. Dr. Claire was great company and laughed at me as I called out to the giant killer squirrels, gators, and bobcats in hope one of them would take a bite out of my leg so I could stop running these dizzying loops. In actuality the dark night was beautiful as the moon would not rise until my final loop. The stars were bright and we laughed away some slow miles together. It was nice to have a pacer again. I hadn’t run with one in years since my course record win at Javelina in 2009 when Anthony Culpepper and my Team Aravapia teammate Nick Coury took turns bringing me in from 100K to the finish. I was excited and almost stopped for a beer at mile 85 when my stopwatch specialist Elizabeth told me I was about to loop George who was in second. Zsofia Inahauzer, an attractive blond FURbee, originally from Hungary offered me grilled cheese and I accepted but it could have been grilled rubber and I would have taken it from her with that Eastern European accent. Dr. Claire and I caught George around mile 88 and wished him well. We also caught the previous champion Bruce (Sung Ho Choi) and female 3rd place (2012 UROC 5th place female) finisher Krystle Martinez who I would share some miles and laughs with on my final loop. I walked every step of that final loop without any liquids, caffeine, or calories. I was tired and wanted to sleep but had put my hat and gloves back on to keep me warm as the moon rose and the ocean breeze picked up. I slept walked the final mile on the pier and worried race director Caleb came to check and make sure I had not thrown myself to the sharks. After I survived the alligators and giant killer squirrels the idea of being shark bait instead of dealing with the delayed muscle onset soreness that was coming seemed absolutely reasonable. A warm fire, a sleeping bag, some tomato soup, and finally a chair! I did jog the last twenty yards to the finish for the cameras at Caleb’s request. For the first time since 2008 I had won and finished a hundred where there would be no prize money or pay day. Pride alone had powered my win much like my first 100 mile finish in 2008 a few miles down the coast. I would be lying if I didn’t say it was anti-climatic, but in a good way. Knowing that I would win and following through on those expectations despite the lack of competition and the infection my body was fighting made me feel stronger. Reconnecting to my routes as an ultrarunner in Florida was humbling. Many times that night I thought back to 2008 and my Ancient Oaks 100 win. Mentors that advised and guided me like Ray Krolewicz and Matt Mahoney came to mind. Now as I begin to coach new runners I feel it is important to know how mentally hard it is to stay awake and moving for such large amounts of time. 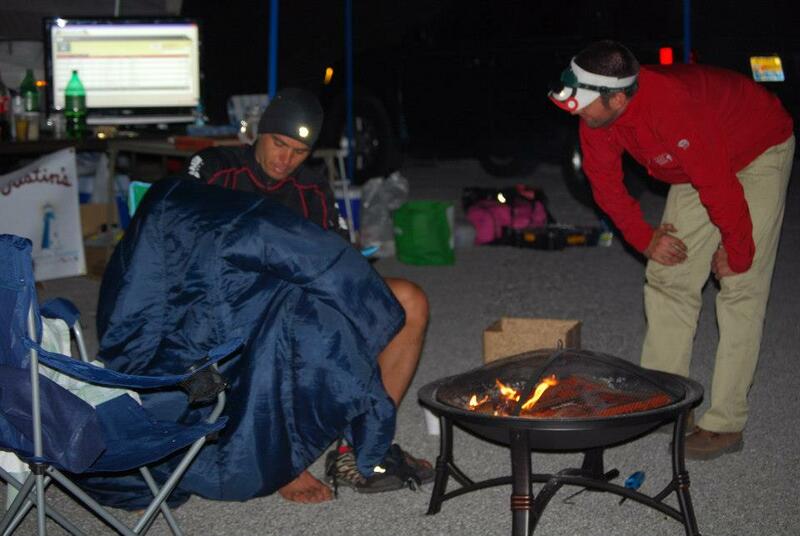 I hung around the finish sleeping on and off until dawn trying to cheer on the other runners as they came through. It was especially inspiring to get to watch super talented hundred newbies Taryn Lynn Giumento & Krystal Martinez finish and the last ultra couple finish together in close to 30 hours! 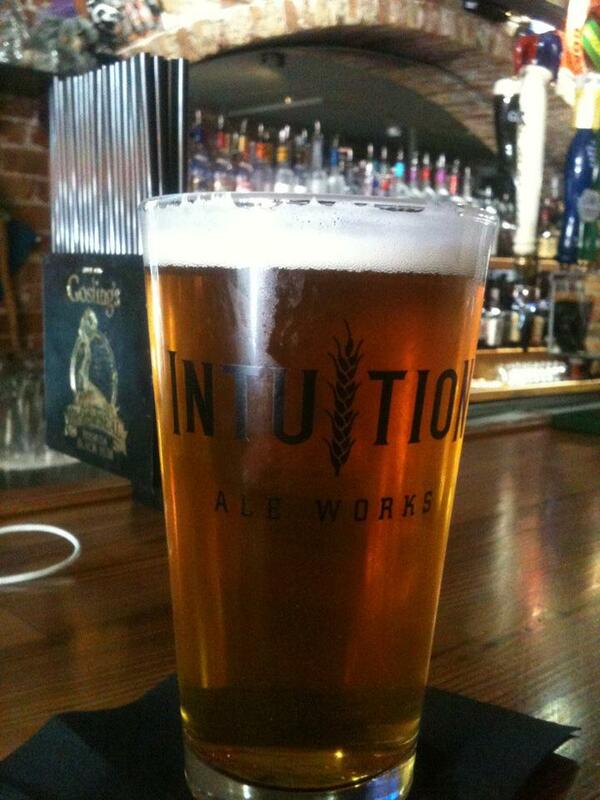 As we shared Intuition Ale Works variety of beers Sunday I thought of the Easter I was missing with my family but was content that I was among my running family. It was great to catch up with Mike Melton and meet and chat about Hardrock with Chris Twiggs. Dr. Claire, Zsofia, and Bambi came by the finish line also. Carey Lynn Clarkson was incredible as she completed her own ultra staying up all night to take photos. After everyone finished Caleb and I cleaned up. I ducked out to the beach for a much needed nap. We headed out for a meal and some beers before we called it an early night and a successful weekend! I awoke sore but able to jog the beach barefoot Monday. We cleaned more, had a giant breakfast, got a pizza pie with Chris, and again slept under the stars! Tuesday morning I awoke tired but with surprisingly fresh legs as Caleb, Chris, and I ran the trails and low tide tree covered shores of Big Talbot State Park on the next island south. I am excited to tour the Fort, Lighthouse, and maybe join in on an evening Track Workout as I end my Spring Break and begin to prepare for Lake Sonoma 50. 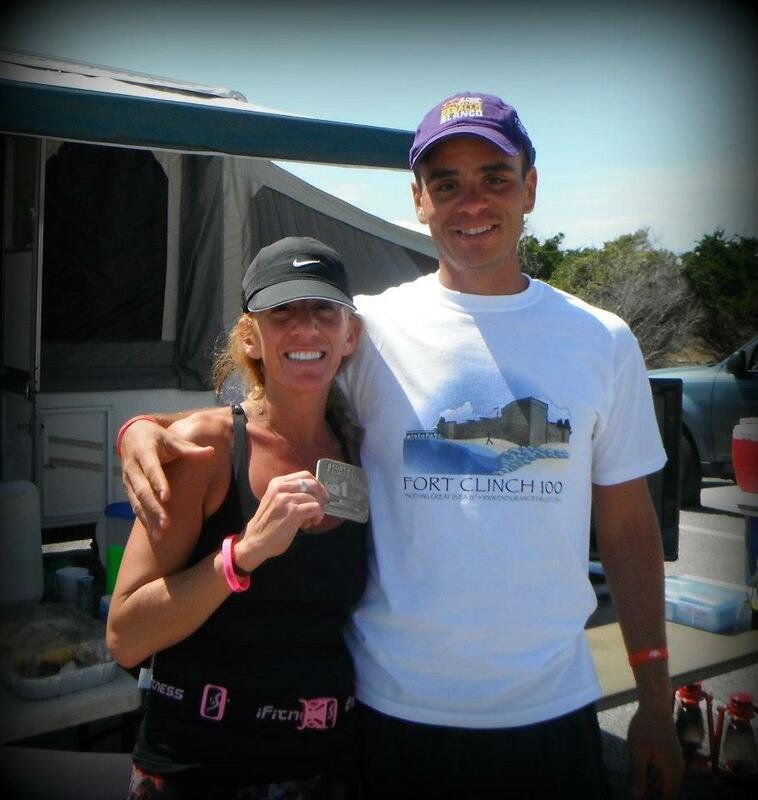 The Fort Clinch 100 is an old school, ultra race put on by a young, professional, passionate, and energetic race director. I hope I can return someday to lower my course record and see the growth of the race. If there ever was a destination race to a beautiful place for those of us that love the ocean and beach, this is it folks! Thanks Caleb, Llama Running, FUR, Chris, Amelia Island Runners, Spira Footware, Ultimate Direction, GENr8 Vitargo, Intuition Ale Works, Amelia Hotel at the Beach, The Crab Trap, Mike Melton, Gene Meade, Florida State Park Rangers, Dr. Claire, 110 %, Justin’s, Red Otter Outfitters, Amelia Island Yacht Basin, Luna Sandals, Athletes Fueled by Mila, and especially my family for understanding why I choose to miss Easter Sunday. 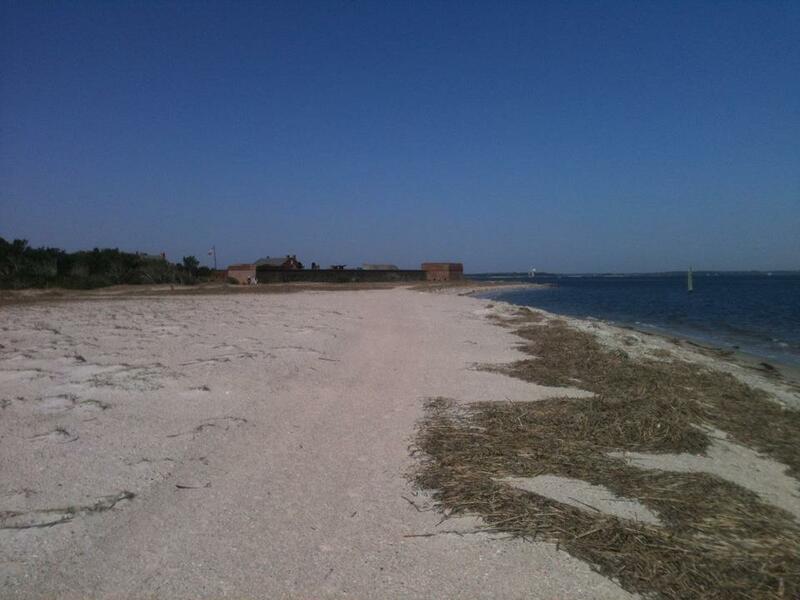 The presenting sponsor of the Fort Clinch 100, Endurance Trust’s motto is “Nothing Great is Easy.” So true! Great race report Dave and good job. Thanks Pat!… Are you running across he USA? Caleb, You did an amazing job!… Dates for 2014 yet? That was a great time with you, Dave! I’ve enjoyed following your journeys in Europe over the months! You are definitely seizing life!